Hynninen provides robust, burnished tone in every song, and this, combined with his knowing and wholly idiomatic way with the texts makes his recital a distinctly pleasurable listening experience. (...) Ondine's recording is top-notch. A marvelous reissue for the Sibelius year. Who could resist the mysterious atmosphere of Die stille Stadt (The Silent Town), magically sung, with an equally magical accompaniment conducted by Leif Segerstam? A tribute for the Sibelius 50th anniversary in 2007, this CD contains fully remastered recordings, originally released in 1994, of Sibelius's Orchestral Songs. In addition to the more familiar songs such as Var det en dröm (Did I just dream? ), Laulu ristilukista (The Song of the Cross-spider) and Kaiutar star baritone Jorma Hynninen also performs seldom heard large-scale and impressive Koskenlaskijan morsiamet (The Rapid-shooter's Brides). Jorma Hynninen is one of the most celebrated Finnish singers. He has not only renewed the song interpretation tradition but also provided the inspiration for new operas. His greatest musical love has always been lied, a genre in which he has concentrated on the song cycles of Schubert, Schumann, Brahms and Wolf and the solo songs of Sibelius, Oskar Merikanto, Toivo Kuula and Yrjö Kilpinen. His concert engagements have taken him all over the world and to such illustrious venues as Carnegie Hall, the Lincoln Center, the Queen Elizabeth Hall, the Royal Albert Hall, the Musikverein, the Concertgebouw, the Boston and Chicago Symphony Halls, and the Tanglewood, Ravinia and Salzburg Festivals. 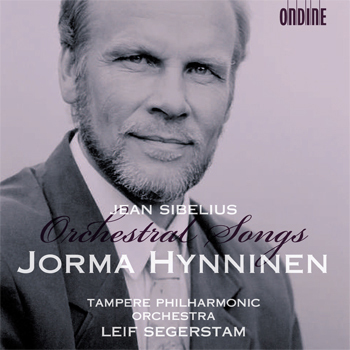 This recording earned Jorma Hynninen an "Artist of the Year 1994" Award by the UK Sibelius Society and won a Cannes Classical Award 1995 in the category Songs/Vocal Recitals 20th Century.